This morning we visited APOPA, the University of Sokoine mine detection rat training center where they train African Pouch Rats how to detect landmines. APOPA is a social enterprise that researches, develops and implements detection rats technology for humanitarian purposes such as Mine Action and Tuberculosis detection. These rats are used in countries like Cambodia, Vietnam and Laos that are no longer at war but still having active landmines in their country. When used in the countries or ‘the operation’ the rats will work with the trainers to clear large boxes of land (approximately 5 x 20 meters) and if they detect a mine, they will scratch at the ground to indicate its presence. Then a detonator is set on that location and the mine is set off at a safe distance. Most landmines need at least 5 kilograms of weight to detonate and since most of these rats are 1 kilogram or less, they are perfect for detection but not detonation. APOPA was founded in 2000 by Bart Weetjens who wanted to address the landmine issues in Sub-Saharan Africa. 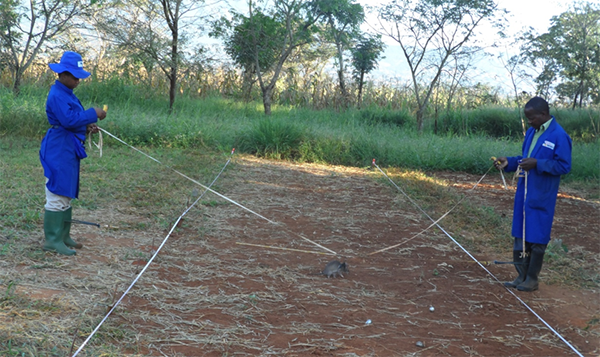 Three years later, while the first landmine detection rats were tested under real conditions in Mozambique, APOPO won the World Bank Development Marketplace Global Competition, which provided seed funding for its Tuberculosis (TB) detection research program. APOPO’ s very successful TB division is a step towards addressing the millions of TB cases that go undetected and can lead to death, in Africa and throughout the world. We were able to witness how they train the rats in different stages to be able to detect TNT powder which is what landmines. The trainers start to work with the rats when they are only 5 weeks old to start socializing them and bonding with the trainer. At 3 months old, they start to work detecting the TNT powder. The trainers use a simple clicker training system to they find the ball with the TNT powder in it, they click and the rat will go to the trainer for a bit of banana as the reward. The rats will graduate to bigger boxes and then start having some balls that don’t have TNT, other objects, smells, etc to try and trick them and ensure that when they are scratching it is actually for the landmines and not just to get a bit of banana. It was impressive of well these rats where trained and interesting to see the process. The director of the program said at the moment, they send these rats to these countries free of charge, all to gather research and in order to help the people in these countries. It was amazing that so much effort, time and resources go into these extremely valuable creatures that make such a difference in these countries and yet, this university is not charging the countries for the rats. After the Apopo Center, we traveled to Mikese Village around Morogoro , which was on top of hill by a chicken farm. To say the smell wasn’t pleasant is an understatement but the view of the surrounding mountains and fields made up for it. We performed three spays at this location and a male dog was prepped to be performed when we realized he already had been castrated! We had a few complications today with our three spays. One spay had bleeding coming from one of the uterine horns prior to removal which Ani successfully stopped and the completed the surgery with no other issues. In another we had a ligature slip on a uterine stump which meant extending the incision caudally to find it and retie the ligature. Our last spay had a transmissible venereal tumor that was removed by Dr. Bennett. This was the third TVT we’ve removed in Tanzania and they are much more common in developing countries than in first world countries. It’s been really good to see how these are removed surgically, especially in less than ideal scenarios. All our surgeries recovered. When we returned to the hotel, Shedrick gave us all little tokens or gifts to take with us since we were such good customers all week. On our way to Mikumi, we passed through Mikumi National Park and saw several giraffes, zebras and a small family of baboons on the side of the road! 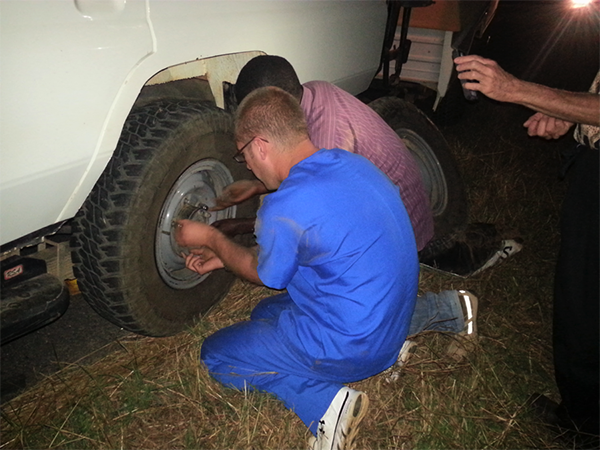 Unfortunately we did get a flat tire on the way there but luckily our driver Habi was well prepared and with everyone’s help (whether Dave and Mike assisting with changing the tire or the multiple phone flashlights) the tire was changed and we arrived at the Tan Swiss Lodge shortly afterwards. Tomorrow we have the safari!! We’re all really looking forward to it! This entry was posted in Tanzania, 2014 by domal@illinois.edu. Bookmark the permalink.